On Tuesday, the former president launched a book titled ‘My Transition Hours’, in which he wrote about issues concerning his administration. 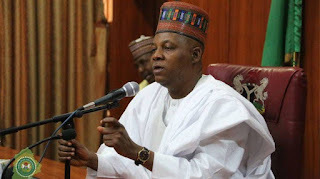 In a statement on Wednesday by Isa Gusau, special adviser on communications and strategy to the governor, Shettima said the former president attempted to sweep under the carpet a report submitted to him by an investigative committee in June 2014 about the abduction of April 2014. “I was amused that despite admitting in paragraph 15, that he had (in May 2014) constituted a Presidential Fact-Finding Committee under Brigadier General Ibrahim Sabo and many others “to investigate” the Chibok abduction, former President Jonathan refused to mention any part or whole of the findings by that panel which had submitted a highly investigative report submitted to him on Friday, June 20, 2014 after the panel held investigative meetings with the then Chiefs of Defense Staff, Army Staff, Air Staff, the DG, DSS and IGP, met all security heads in Borno, visited Chibok, met with parents of abducted schoolgirls, met surviving students, interrogated officials of the school and the supervising ministry of education, interrogated officials of WAEC and analyzed all correspondences. Shettima advised the former president to write a second book on account of his presidency which should contain the facts as they were presented to him, regarding the Chibok abduction rather than the fiction he made public on Tuesday.